I have created a self-signed SSL certificate for the localhost CN. Firefox accepts this certificate after initially complaining about it, as expected. Chrome and IE, however, refuse to accept it, even after adding the certificate to the system certificate store under Trusted Roots. Even though the certificate is listed as correctly installed when I click "View certificate information" in Chrome's HTTPS popup, it still insists the certificate cannot be trusted. What am I supposed to do to get Chrome to accept the certificate and stop complaining about it? Using Chrome, hit a page on your server via HTTPS and continue past the red warning page (assuming you haven't done this already). Open up Chrome Settings > Show advanced settings > HTTPS/SSL > Manage Certificates. Click the Authorities tab and scroll down to find your certificate under the Organization Name that you gave to the certificate. Select it, click Edit (NOTE: in recent versions of Chrome, the button is now "Advanced" instead of "Edit"), check all the boxes and click OK. You may have to restart Chrome. You should get the nice green lock on your pages now. On the page with the untrusted certificate (https:// is crossed out in red), click the lock > Certificate Information. NOTE: on newer versions of chrome, you have to open Developer Tools > Security, and select View certificate. Click the Details tab > Export. Choose PKCS #7, single certificate as the file format. Then follow my original instructions to get to the Manage Certificates page. 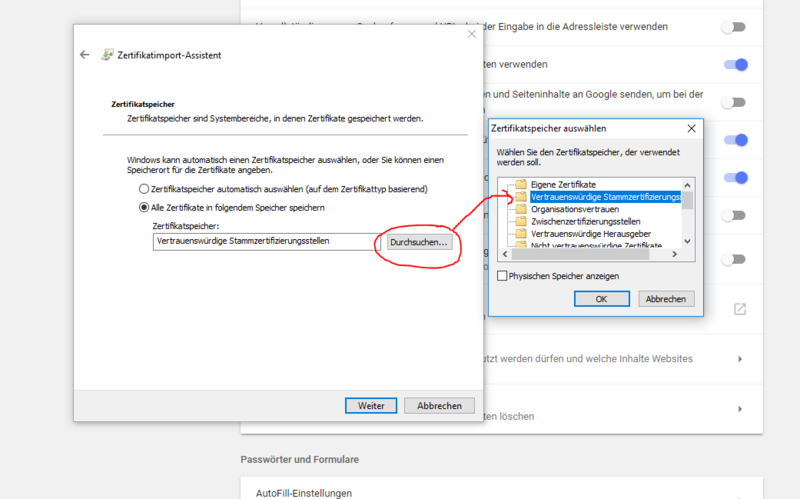 Click the Authorities tab > Import and choose the file to which you exported the certificate, and make sure to choose PKCS #7, single certificate as the file type. Check all boxes and click OK. Restart Chrome. open this file (ending with a .cer extension); this opens the keychain application which allows you to approve the certificate. As of Chrome 58, identifying the host using only commonName is being removed. See further discussion here and bug tracker here. In the past, subjectAltName was used only for multi-host certs so some internal CA tools may not include them. If your self-signed certs worked fine in the past but suddenly started generating errors in Chrome 58, this is why. So whatever method you are using to generate your self-signed cert (or cert signed by a self-signed CA), ensure that the server's cert contains a subjectAltName with the proper DNS and/or IP entry/entries, even if it's just for a single host. UPDATE 11/2017: This answer probably won't work for most newer versions of Chrome. UPDATE 02/2016: Better Instructions for Mac Users Can be Found Here. Click the Details tab, the click the button Copy to File.... This will open the Certificate Export Wizard, click Next to get to the Export File Format screen. Click Browse... and save the file to your computer. Name it something descriptive. Click Next, then click Finish. Click the Trusted Root Certification Authorities tab, then click the Import... button. 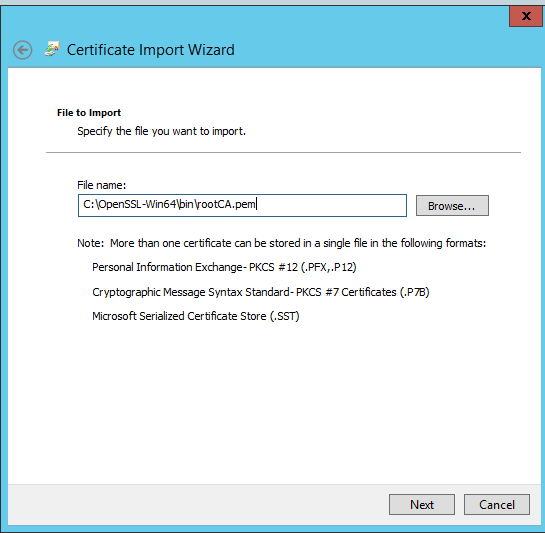 This opens the Certificate Import Wizard. Click Next to get to the File to Import screen. Click Browse... and select the certificate file you saved earlier, then click Next. Click Yes on the security warning. Configuring SSL certificates on Linux. P.S. Please also make sure that you have libnss3-tools, before you can use above commands. sudo yum install nss-tools # on Fedora, Red Hat, etc. "badidea" Chrome version 62 - 64. You don't need to look for input field, just type it. It feels strange but it is working. I tried it on Mac High Sierra. Now they have it camouflaged, but to see the real BYPASS_SEQUENCE you can run following line in a browser console. If you want to create a new self signed cert that's fully trusted using your own root authority, you can do it using these scripts. echo "To use these files on your server, simply copy both $DOMAIN.csr and"
echo "device.key to your webserver, and use like so (if Apache, for example)"
Choose "File | Import Items..."
Browse to the file created above, "rootCA.pem", select it, and click "Open"
Select your newly imported certificate in the "Certificates" list. Click the "i" button, or right click on your certificate, and choose "Get Info"
Change "When using this certificate" to "Always Trust"
Close the dialog, and you'll be prompted for your password. Close and reopen any tabs that are using your target domain, and it'll be loaded securely! and as a bonus, if you need java clients to trust the certificates, you can do so by importing your certs into the java keystore. Note this will remove the cert from the keystore if it already exists, as it needs to to update it in case things change. It of course only does this for the certs being imported. echo "This script needs to be run as root!" Drag that little certificate icon do your desktop (or anywhere). Double click the .cer file that was downloaded, this should import it into your keychain and open Keychain Access to your list of certificates. In some cases, this is enough and you can now refresh the page. Double click the newly added certificate. Under the trust drop down change the "When using this certificate" option to "Always Trust"
Now reload the page in question and it should be problem solved! Hope this helps. echo "Adding certificate for $SERVERNAME"
echo "http:// and such will be stripped automatically"
There is a secret bypass phrase that can be typed into the error page to have Chrome proceed despite the security error: thisisunsafe (in earlier versions of Chrome, type badidea, and even earlier, danger). DO NOT USE THIS UNLESS YOU UNDERSTAND EXACTLY WHY YOU NEED IT! The latest version of the source is @ https://chromium.googlesource.com/chromium/src/+/refs/heads/master/components/security_interstitials/core/browser/resources/interstitial_large.js and the window.atob function can be executed in a JS console. Go to https://localhost:8090 in your browser. You can use --ignore-certificate-errors as a command line parameter when launching chrome (Working on Version 28.0.1500.52 on Ubuntu). This will cause it to ignore the errors and connect without warning. If you already have a version of chrome running, you will need to close this before relaunching from the command line or it will open a new window but ignore the parameters. I configure Intellij to launch chrome this way when doing debugging, as the test servers never have valid certificates. I wouldn't recommend normal browsing like this though, as certificate checks are an important security feature, but this may be helpful to some. I followed @Brad Parks answer. On Windows you should import rootCA.pem in Trusted Root Certificates Authorities store. Then, in my case I have a self hosted web app, so I need to bind certificate with IP address and port, certificate should be on MY store with private key information, so I exported to pfx format. With mmc console (File/Add or Remove Snap-ins/Certificates/Add/Computert Account/LocalComputer/OK) I imported pfx file in Personal store. But I realized that I should import certificate of root authority not certificate for domain. So I used mmc console (File/Add or Remove Snap-ins/Certificates/Add/Computert Account/LocalComputer/OK) I imported rootCA.pem in Trusted Root Certificates Authorities store. Restart Chrome and et voilà it works. The only thing I could not achieve is that, it has obsolete cipher (red square on picture). Help is appreciated on this point. With makecert it is not possible add SAN information. With New-SelfSignedCertificate (Powershell) you could add SAN information, it also works. Are you sure the address the site is being served up as is the same as the certificate? I had the same problems with Chrome and a self-signed cert, but in the end I found it was just incredibly picky about the validation of the domain name on the cert (as it should be). Chrome doesn't have it's own cert store and uses Window's own. However Chrome provides no way to import certs into the store so you should add them via IE instead. Also take a look at this for a couple of different approaches to creating self-signed certs (I'm assuming you're using IIS as you haven't mentioned). 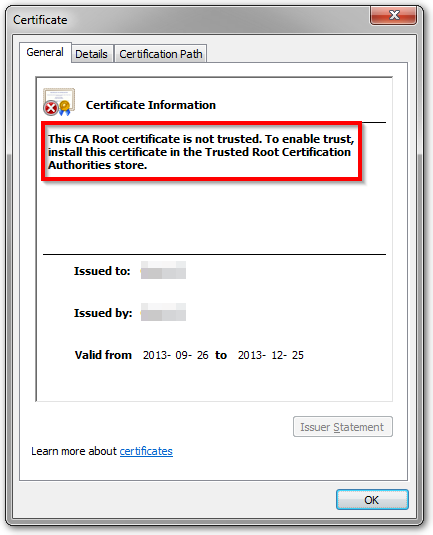 It tells you which certificate store is the correct one, it's the Trusted Root Certification Authorities store. ROOT is the internal name of the certificate store mentioned earlier. cert.pem is the name of your self-signed certificate. What is shown in the blog did not work. You'll need to follow the blog on how to get the cert file, after that you can use the command above and should be good to go. This post is already flooded with responses, but I created a bash script based on some of the other answers to make it easier to generate a self-signed TLS certificate valid in Chrome (Tested in Chrome 65.x). Hope it's useful to others. The GUI for managing SSL certs on Chromium on Linux did NOT work properly for me. However, their docs gave the right answer. The trick was to run the command below that imports the self-signed SSL cert. 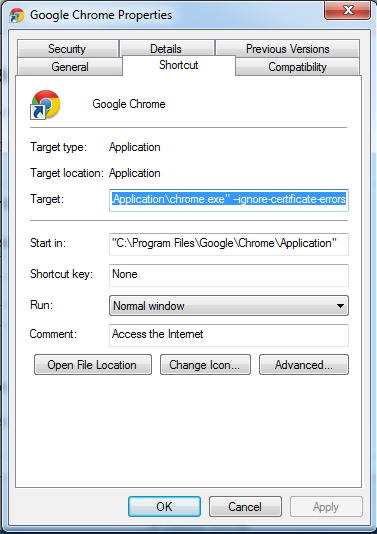 Just update the name of the <certificate-nickname> and certificate-filename.cer, then restart chromium/chrome. As of Chrome 58+ I started getting certificate error on macOS due missing SAN. Here is how to get the green lock on address bar again. Refresh the page https://domain.dev in Google Chrome, so the green lock is back. In the address bar, click the little lock with the X. This will bring up a small information screen. Click the button that says "Certificate Information." Click and drag the image to your desktop. It looks like a little certificate. Double-click it. This will bring up the Keychain Access utility. Enter your password to unlock it. 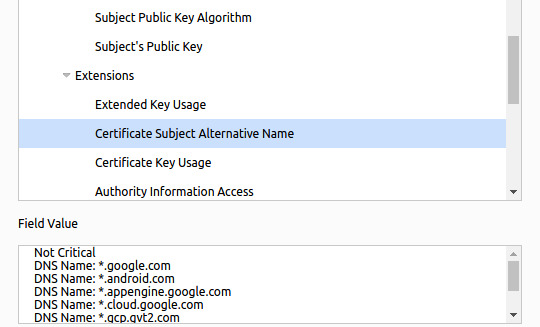 Be sure you add the certificate to the System keychain, not the login keychain. Click "Always Trust," even though this doesn't seem to do anything. After it has been added, double-click it. You may have to authenticate again. 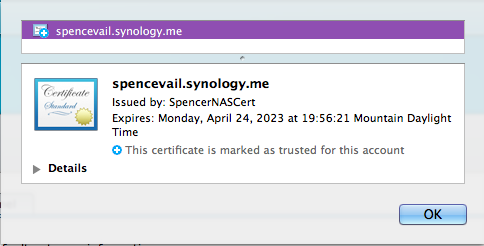 "When using this certificate," set to "Always Trust"
then, add yoursite.crt and yoursite.key to your nginx conf. It didn't work for me when I tried to import the certificate in the browser... In chrome open Developer Tools > Security, and select View certificate. Click the Details tab and export it. Run this command and if you see the file You've just imported You are good to go! Don't forget to restart chrome!!! When I start Chrome with this script self-signed certificates are working without a problem. But don't browse the web with the browser launched with this script you will not be warned about invalid certificates! This is something that keeps coming up -- especially for Google Chrome on Mac OS X Yosemite! Thankfully, one of our development team sent me this link today, and the method works reliably, whilst still allowing you to control for which sites you accept certificates. Type chrome://flags/ in the address bar. Scroll to or search for Remember decisions to proceed through SSL errors for a specified length of time. Select Remember for three months. Click the red lock with the cross in your address bar when trying to open your https localhost environment. There'll open a window with some information about the certificate. Add it to your 'System' keychain (not your 'login' keychain which is selected by default). Open your keychain (again) and find the certificate. Click on it and make sure you "Trust" all. Restart chrome and it should work. Fix for Chrome on Windows. First, you need to export the certificate. Locate the url in the browser. “https” segment of the url will be crossed out with the red line and there will be a lock symbol to the left. Right click on the crossed-out "https" segment. Export the certificate, follow directions accept default settings. Under HTTPS/SSL click to "Manage Certificates"
Go to "Trusted Root Certificate Authorities"
There will be a pop up window that will ask you if you want to install this certificate. Click "yes". It expected to ignore certificate errors and allow you to access invalid certificate websites. Better detailed instructions in https://support.opendns.com/entries/66657664. I was experiencing the same issue: I had installed the certificate in to Windows' Trusted Root Authorities store, and Chrome still refused the certificate, with the error ERR_CERT_COMMON_NAME_INVALID. Note that when the certificate is not properly installed in the store, the error is ERR_CERT_AUTHORITY_INVALID. As hinted by the name of the error, this comment, and this question, the problem was lying in the declared domain name in the certificate. When prompted for the "Common Name" while generating the certificate, I had to enter the domain name I was using to access the site (localhost in my case). I restarted Chrome using chrome://restart and it was finally happy with this new certificate. 2) sub / intermediate certificate [signed by Root CA]. 3) normal / end-entity certificate [signed either by Root CA or sub-CA] (commonName or subjectAltName (SAN) as localhost) (also include https://localhost/ as the URI in SAN). 4) Import / Install that Root CA in your Windows OS (because you mentioned IE. Google Chrome is using the same resources while looking for certificates chain - https://www.chromium.org/Home/chromium-security/root-ca-policy ) as 'Trusted Root Certification Authorities'. 5) Install that end-entity certificate as your web server certificate, and it stops complaining that error message. Not the answer you're looking for? Browse other questions tagged google-chrome ssl certificate self-signed or ask your own question. How to create self-signed VALID certificate for chrome and Firefox? 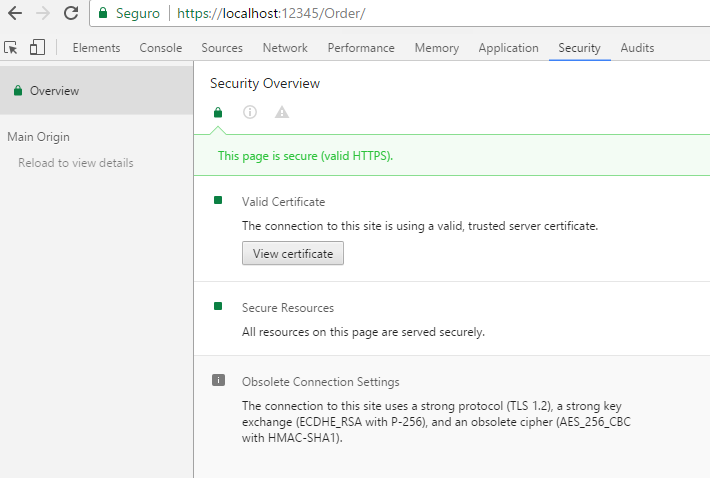 How to create a SSL certificate and secure connection on localhost? 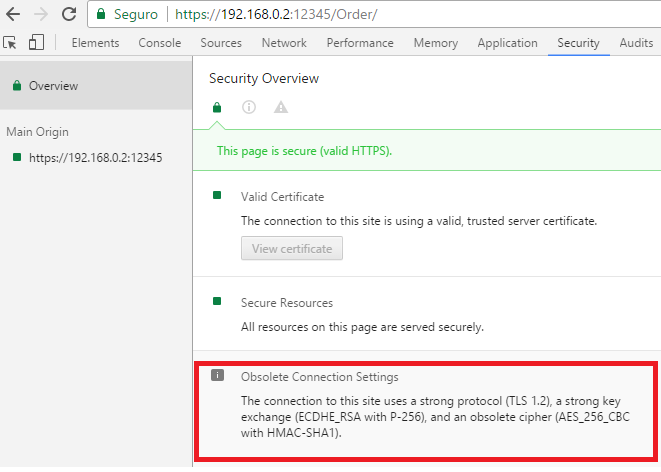 How do I restore a missing IIS Express SSL Certificate? 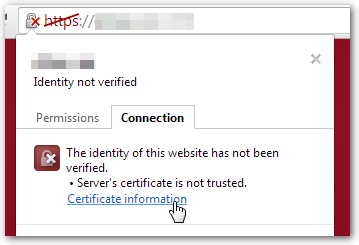 .NET doesn't trust my self-signed certificate, but IE does?